Bognor blew a half-time lead to lose a vital Bostik premier clash at home to Enfield – and suffered yet another injury setback. Mason Walsh's goal just before the break set things up nicely but they allowed Enfield back into after half-time – following the loss of another centre-half injury. This time it was Gary Charman – in only his second game since returning to Nyewood Lane to help solve a defensive injury crisis – who was forced off after suffering a back injury. The defeat leaves Bognor down to 10th in the table – when they could have been in the top five had they held on to their interval lead. Bognor's mood was not helped by the winning goal being scored after a clear handball immediately before the strike. Bognor were boosted pre-match by Brad Lethbridge and Walsh declaring themselves fit, despite having come off at Harlow on Saturday with heavy-looking knocks. But Lethbridge's Pompey squad-mate Dan Smith was needed by his parent club for their Checkatrade Trophy tie with Arsenal U21s. The Rocks went into the game in ninth place but knowing only three points separated the sides between fifth and 12th. Tommy Block was first to shoot at goal for Bognor after some good trickery down the left and into the box by Walsh, then Walsh found space from close range to force a fine diving save from Joe Wright. 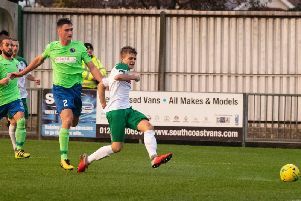 Around the 15-minute mark Enfield came on strong and caused two or three moments of alarm as the Rocks defended the goal in front of Seasons and the new canopy. Midway through the first half the Rocks were unlucky to concede a free-kick a couple of yards outside the area but Remi Sutton's curling effort was blocked by the wall. Bognor's play became sloppy and Enfield were threatening to take advantage, but a couple of dangerous balls into the six-yard box were dealt with. A long ball from the back by Harvey Whyte almost slipped through to Lethbridge but it just ran away from him and through to Wright. Charman went into the book on 33 minutes for a foul on the lanky Muhammadu Faal, who was proving a handful for the hosts. Things began to get a little feisty and the referee let one or two questionable challenges go – deciding not to book Enfield captain Ryan Blackman for a foul on Jimmy Muitt that was as bad as Charman's card-earning challenge before it. Suddenly, a couple of minutes before the break, Bognor were ahead – and it was Lethbridge who made it. He battled for possession and got to the byline on the right, near the corner flag, before pulling back a cross that was just right for Walsh to run on to and sidefoot past Wright. Bognor had to make a change at the start of the second half, with the club's centre-half injury curse striking again. Charman had injured his back and was replaced by Tommy Scutt, with Block dropping back to partner Chad Field at the back. It follows injuries earlier in the season that have ruled out centre-halves Keaton Wood and Corey Heath long-term - and now Charman's problem seems to leave them once more with only one fit recognised central defender. There was an opening for Enfield when Field failed to clear a ball down the visitors' left but Faal shot high and wide with the goal in his sights. Muitt and Scutt set Lethbridge away down the left but his grass-cutter of a shot after cutting inside was disappointing. Lethbridge had come alive and fired a fierce shot too close to the keeper after stepping past a couple of challenges. Enfield flashed a ball across the Rocks goalmouth – then Scutt got into a great position in the box at the other end but could only find a defender's boot. Lethbridge tried one from 25 yards but it drifted well wide. Aaron Greene shot hard and low across Lincoln's goal on 62 minutes and the officials ruled the keeper had got a touch. But the corner came to nothing. Brilliant work by Walsh down the left on 65 minutes ended in Muitt having a chance to shoot but it was wide when he really ought to have at least tested Wright. Bognor at times were inviting pressure and they paid the price on 69 minutes when Greene got free rather easily down the left and crossed to the far post, where Billy Bricknell headed past Lincoln. Davies and Muitt led an attack that ended in the striker forcing a brilliant save at his near post by Wright. Whyte hit a 25-yard drive over the bar on 76 minutes and it was anyone's game going into the final stages. Jimmy Wild was introduced in place of Lethbridge with 11 minutes left. Block gave away a needless throw-in near the corner flag and after that was initially cleared the ball fell to Blackman, who fired a volley over Lincoln and into the top corner. There was a clear handball in the build-up that a basketball player might have been proud of, and Bognor's players protested furiously, but the goal stood. A check of the match video afterwards showed the handball was as clear as could be. Davies was booked for his protests. The Rocks did up the tempo after going behind but too often their final ball was poor. Their efforts to find a way through the Enfield defence weren't helped by some more terrible decisions by the referee. In injury time Muitt seemed to be brought down in the box but the referee waved play on and a shot was saved by Wright – and that was the last action of the game. Bognor will have to try to lift themselves in time for the visit of high-flying Dorking on Saturday. Rocks: Lincoln, Davies, Tomlinson, Tuck, Field, Charman, Whyte, Block, Lethbridge, Muitt, Walsh. Subs: Scutt, Wild, Osborne, Brady, Teixeira. Enfield: Wright, Hatton, Sutton, Johnson, McLean, Rumens, Purcell, Blackman, Bricknell, Faal, Greene. Subs: Olomowewe, Hope, Sayoud, Mubaimi, Youngs.